A Place in the Sun is a racy novel; rich in history and suspense. Written by Kola King, who a veteran journalist, it is a love story based in the fictional country of Songha, which in reality looks like life in the early days of colonial conquest in Northern Nigeria where the author hails from. Beginning from Chinua Achebe’s Things fall Apart, many a fictional work has been done about life in Nigeria and Africa in this period. 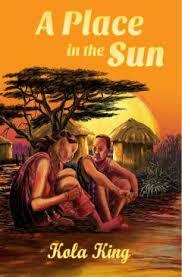 A Place in the Sun stands out of the crowd not only because it is one of the few written about Northern Nigeria in the colonial era but because it is a beautifully crafted work of art, mixed with history and culture. The intriguing thing about it is the ability of the author to hold the reader spellbound and to educate him until he gets to the very last page. The first edition of the book which was recently released by Verity Publishers of Pretoria in South Africa comes in paperback and e-Book form. The print work is excellent thus reducing the stress of the reader as he goes through the 42 chapters of the novel. The people of Shongaland were “renowned for their hospitality, warmth and friendliness.” The author also goes further to describe them as “great farmers and intrepid hunters; fishermen, swift with their nets and skillful with canoeing.” They are also said to be “giant men, bold and unafraid warriors” who had conquered and subdued their neighbours. Thus through simple but captivating and effective choice of words, Kola King is able to get the reader interested in the land and the people that make the story. The story itself looks real and though full of suspense, intrigue and sometimes tragedy, the reader is not subjected to mindless sensationalism and over dramatization. Once in a while, the author falls back on history and this helps to remind the reader that this is a real world, a real life situation. For a writer who is making his debut in fictional writing, A Place in the Sun will certainly give the author a place under the sun where there is a rather large crowd of writers. The novel is about the love story of Zakka, a brilliant young lad from Tekota who excels in his studies at primary school in his home village. Zakka later travels to the big town of Kartadu for his training at a Teachers College and as result of his demonstrated brilliance is employed immediately on graduation to be an auxiliary teacher in the same school. His diligence at work and exemplary character brings him to the attention of the education secretary who orders his employment at the head office of the regional headquarters of the education department on the completion of his one year stint as an auxiliary teacher. Zakka falls in love with Matta, a girl from Tekota who has had a turbulent love life. Impregnated by her teacher, a bonhomie drunkard teacher by the name Gora at a tender age, Matta was given out in marriage at that age. Tragically, the marriage was bedevilled with a series of misfortunes. There was drought in the land as a result of which poverty prevailed, bringing starvation and death in its wake. The hard times brought strife in the relationship of the newly married Gora and Matta. Thus Gora who had shown signs of improvement from his carefree life of alcoholism relapsed back to his bad old ways. The pregnancy itself turned out to be another disaster for it lasted for a whole twelve months at the end of which the child is stillborn. These disasters ended with Matta calling it quits with the marriage. Meanwhile, the brilliant Zakka has made his forays into the world beyond Tekota to the Teachers Training College at Kartadu. Eventually, Matta pulls herself out of the setbacks of her life and returns to complete her primary education. She joins Zakka at Kartadu even though in a different school, a teachers’ college for girls. The two meet and gradually a love relationship builds up. The drunken philanderer Gora has also gotten out of his stupor. Dismissed from his teaching job because of excessive alcoholism, he flees Tekota and after a long spell of hardtimes in Kartadu he drops his drinking habits and gets a job at the railways. A new improved Gora gets rapid promotion there and comes back to claim his long lost wife – Matta. The story becomes complicated. Zakka cannot marry Matta because the dowry paid by Gora has not been returned and therefore by tradition Matta is still his wife. Zakka himself is up against his father who has found a fresh new wife for him and does not want to hear that his son with such a bright future is going to marry a divorcee woman with such a sordid history like Matta. The story ends tragically when Gora, ever insistent on reclaiming his wife is on his way to Tekota village gets drowned in a canoe mishap. The coast thus becomes clear for the two love birds - Zakka and Matta to have their way. Beyond the excellent print and beautiful prose, A Place in the Sun is a book of history. It documents the contradictions of a colonized African society – the challenges of modernity against tradition. It is a recommended text to adults because it entertains and enthrals; but it is also good for young African students who need it to know where they are coming from and to improve their diction and writing skills.